Msgr. James Bartylla, vicar general, will serve as administrator of the diocese until a successor to Bishop Morlino is appointed. 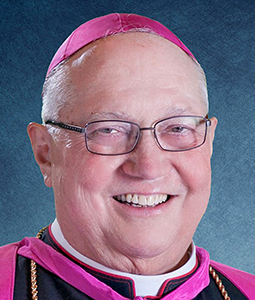 The funeral Mass for Bishop Morlino will be celebrated Dec. 4 at St. Maria Goretti Church in Madison, followed by interment at Resurrection Cemetery. Born Dec. 31, 1946, in Scranton, Pa., Robert Charles Morlino was an only child. His father, Charles, died while he was in high school; his mother, Albertina, died in 1980. He was raised in Lackawanna County, Pa., graduating from the Jesuit-run Scranton Preparatory High School. He entered the seminary for the Maryland province of the Society of Jesus and was ordained to the priesthood for that province June 1, 1974. He earned a bachelor’s degree in philosophy from Fordham University, a master’s degree in philosophy from the University of Notre Dame, and a master of divinity degree from the Weston School of Theology in Cambridge, Mass. He also had a doctorate in moral theology from the Pontifical Gregorian University in Rome, with a specialization in fundamental moral theology and bioethics. In 1981, Father Morlino became a priest of the Diocese of Kalamazoo, Mich., and served there as vicar for spiritual development, executive assistant and theological consultant to the bishop, as moderator of the curia and as the promoter of justice in the diocesan tribunal. He was administrator of a number of parishes, and later rector of St. Augustine Cathedral in Kalamazoo. Father Morlino was scheduled to begin a full-time faculty appointment as professor of theology at Sacred Heart Major Seminary in Detroit when, on July 6, 1999, St. John Paul II appointed him the ninth bishop of Helena, Mont.